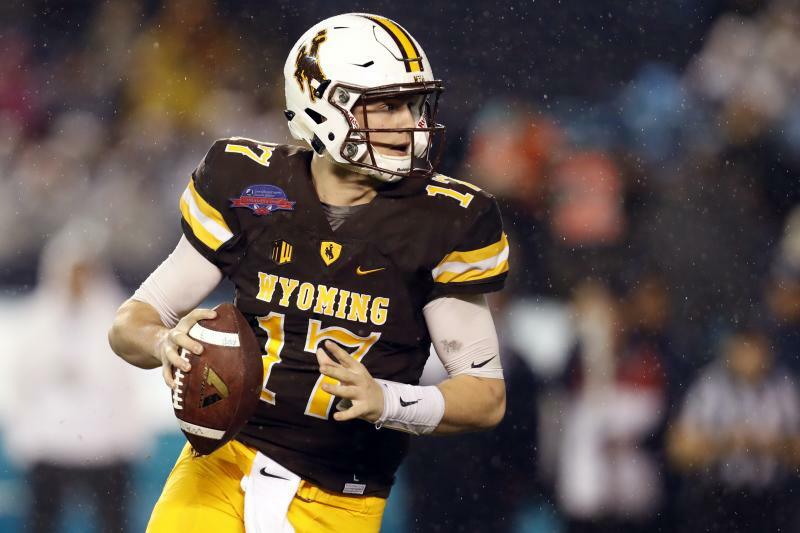 Josh Allen, Wyoming’s prolific passer, is the ultimate wildcard of this year’s NFL Draft. There is no denying his physical abilities and athletic talent. If you asked Mel Kiper to draw up the ideal quarterback, it would probably resemble Allen. Allen stands at 6 feet 5 inches tall and has the strongest arm of all players in the draft. He simply throws a bullet of a pass. Despite his physical traits, Allen is not the best quarterback in this draft. I would argue he’s barely a top-five passer prospect. This is because Josh Allen lacks the mentality of an NFL quarterback. I don’t mean to question Allen on a personal level. I am just pointing out that he has yet to show he has the football mind necessary to succeed at the next level. To reiterate, Josh Allen is a near perfect specimen of what NFL scouts are looking for in quarterbacks physically. Allen is 6″5′ tall, 240 lbs heavy. To compare, Joe Flacco is 6″6′, 245 lbs. Additionally, both quarterbacks have very strong arms, giving each the ability to exploit downfield passes with maximum effect. Allen’s Flacco-esque stature and arm strength is the main reason the Baltimore Ravens are reportedly interested in the prospect. Allen is tough, and his build makes him very difficult to take down. Unlike Flacco, however, Allen is very mobile. While watching his tape, I saw that Allen was able to escape situations that would almost certainly lead to a sack for some less athletically gifted quarterbacks. Allen’s physical ability is second to none in this draft, however, Allen is not a first-round quarterback. Josh Allen is one of the most inconsistent quarterbacks in the NFL Draft this year. Whether it be on a play by play level or game to game level, Allen cannot be trusted to hold a pattern. It was very frustrating to watch Allen’s tape, especially when these inconsistencies surfaced. On some plays, Josh Allen would make throws that amaze me, throws that most quarterbacks can not make. On other plays, however, everything seems to break down, and Allen will make a terrible decision. His accuracy, precision, and decision making are all subject to change from play to play. Allen has a tendency to force passes to receivers who are not always in a fair situation. Allen is prone to careless interceptions, and subpar decision making overall. On a game to game basis, Allen also failed to stay consistent. His quarterback rating ranged from 51.6 to 178.1 His completion rate also varied heavily throughout the season. On four occasions, Allen completed just 50% or less of his passes. His lowest rate of the season was 37.5%, while his highest was 72.7%. His yards per game total ranged from 64 yards to 234 yards. In short, Allen is not consistent, which will hurt him in the NFL. Additionally, Allen hurt his throwing arm this past year and sat out two games because of it. To pick Josh Allen in the first round of the 2018 NFL Draft is to gamble your team’s offensive ability in 2018, and potentially beyond. His inconsistencies and careless tendencies are going to hurt any offense. His physical abilities seem to mascarade these negative traits, as many analysts are ranking Allen as the best quarterback in this draft. Allen is not the best quarterback in this draft, he’s barely a top-five quarterback. Josh Allen is too much of a risk to be drafted in the first round by any team. His best value comes in the second round, where teams have more room to gamble. First round players need to be immediate starters, while second round players have time to develop. That’s what I suggest for Allen. He needs to develop in his weak areas before he can lead an offense. If he can improve on his inconsistencies and faults, he will be an excellent NFL quarterback, I just don’t think he’s there yet. I rated Josh Allen as a 7.7 prospect (out of 10.0). He’s the fifth best quarterback this draft class, behind Baker Mayfield, Sam Darnold, Josh Rosen, and Mason Rudolph. Allen is a developmental project quarterback and is overrated by most analysts. He’s a second-round quarterback being pushed as potentially the best prospect in the draft. With a year or two of sitting behind an experienced quarterback, Allen could become the face of a franchise, but he is not there yet. The Ravens are likely interested in Allen, but only if he somehow slipped to the second round. Flacco is getting older, and the Ravens are looking for an heir-apparent. With proper training behind Flacco, Allen could easily transition into the starting role after Flacco retires. Although the Ravens would at least be open to drafting Allen, they won’t get the chance. Allen will be drafted high in the first round, as another franchise will gamble the immediate future on a wildcard quarterback.